Ahhh Friday night. A pie in the oven, rain down outside, wind howling through the trees, no central heat, and three cats pumped up on catnip. Right now I’m making the poet a s’mlove pie for tomorrow’s celebration–he’s taking his final comprehensive exam for his master’s program at 9 am! I know he’s going to do fine, although he’s probably wide awake and unable to sleep for fear of forgetting Elizabeth Bishop or Robert Frost or W.B. Yeats. I don’t envy him. And nothing says “I think you’re the best” like a fresh uber chocolatey, uber peanut buttery pie! As I mentioned, it’s raining and 50 degrees outside (and I just rode my bike and to and from work in it, ick). Simply, it’s one of those days that calls for soup. Good, thick, hearty, warm soup. Deb’s (at Smitten Kitchen) Beef, Leek, and Barley Soup seemed just the thing. Except, wait, it calls for “two big, meaty short ribs.” Ew. So not vegan. So I thought about making it with only vegetables. Except veggies just weren’t cutting it. I needed texture, damnit! Then I remembered the “Better than Beef” (or whatever corny name it’s called) TVP chunks that I can get at the local co-op. Ba-da-bing! 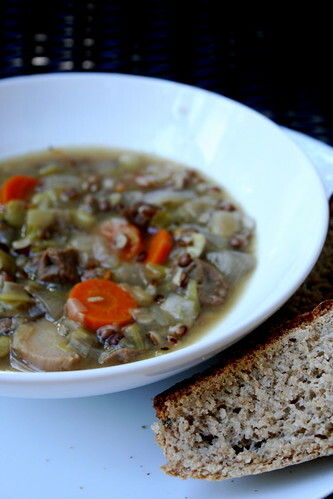 Thus, I present to you my version of “Beef,” Leek, and Barley Soup. It was just as easy as promised and so much more satisfying sans dead cow. The poet, a raging omnivore loved it and thought it was the best thing since sliced bread. Oh hey, and speaking of bread, see that tasty, tempting slice in the photo? I’ll post that recipe next. Rehydrate 1 cup of “beef” TVP chunks. After they’re rehydrated, pour them into a big soup pot (mine is 5 quarts…I think? It’s huge). Add 1/2 cup of barley, three big cloves of garlic shopped up, two chopped onions, three chopped carrots, 1 cup frozen lima beans, and three leeks cut lengthwise and then into segments–use both the white and the green parts. Add eight cups of vegetable stock and let it simmer on the back burner for at least three hours. Serve with a thick slice of fresh baked bread! This soup looks delicious. I love any soup that has barley in it. Oh that does look fantastic!!! Gorgeous soup – I love getting inspired by Deb’s recipes!! Have fun with the celebration!!! Warmth and comfort in a bowl! Good luck to the poet! How sweet of you to bake him a yummy pie! oh yeah, that WAS the perfect thing for yesterday’s crappy cold & rainy weather. i took another route and had soul v. comfort food. soup would have been better for me. Love this soup! Barley is one of my favorite grains. Can’t wait to try this out! Thanks so much for your comment on my blog, too! And for the link I love your blog! I’ve added you to my Google Reader and will be updating my links asap (hopefully before the end of the year–ha ha!!). And those pumpkin baked goods–aye! Amazing. So many bookmarks, so little time. . . ! dude, can I come on over for pie?? This sounds great, Jes. I love barley soups. And I hope your poet rocked his exams! barley in soup is so good. s’mlove pie is the best. What a good treat after exam torture. I saw this recipe too and thought how wonderful it would be once veganized! Thanks for taking the work out of it for me. I just love soups and stews! This looks so wonderful! Great photo! I really love barley and I am so in love with leeks lately. Soup is always a perfect meal when the weather is chilly out (even when it’s not, I still love it); I will definitely have to try this! this looks scrumptious! i love a good hearty soup served up with homemade bread. yes yes yes.